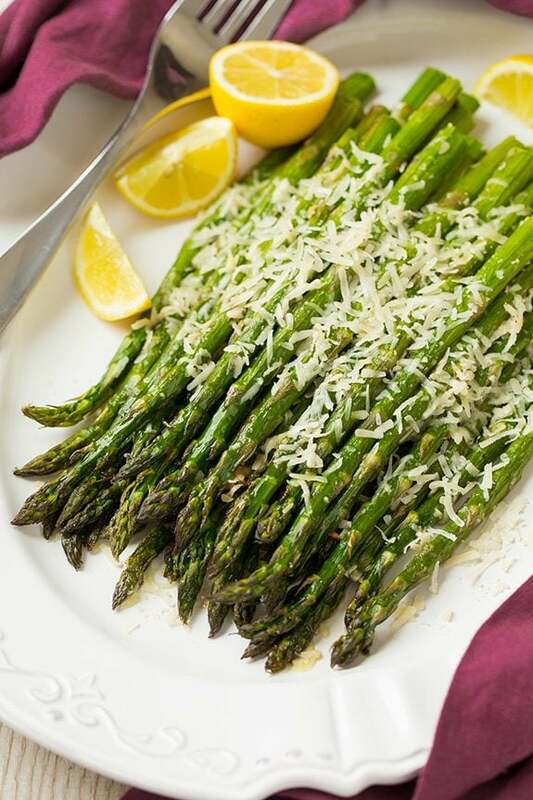 A super easy, super delicious Roasted Parmesan Asparagus recipe! Includes fresh garlic and shredded Parmesan for great flavor. It’s the perfect side to beef, chicken or fish. I don’t share a whole lot of side dish recipes here, because to be honest the side dish recipes around my house usually consist of 1 to 3 ingredients, like steamed veggies or veggies and an upgrade of browned butter (yep, going all out with that). I put most of my efforts into the main dish, because I don’t usually have a lot of time to make a big meal, especially on weeknights. So, with that said here is a super easy side dish recipe that you can prepare and have ready in no time! Many of you have likely already tried this or something similar, but if you haven’t then make it…like right now. Roasted veggies are my FAVORITE! The depth of flavor that shines through from roasting veggies just can’t be found from any other method of cooking (except maybe grilling, but still there’s a different more charred flavor profile there). 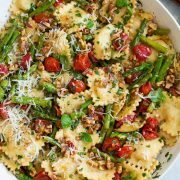 Basically, this Parmesan asparagus will outshine your main dish and everyone will want a double serving! This roasted asparagus is so irresistibly good (yes, I just used the word irresistible with a vegetable), and of course asparagus is so good for you, so eat up! Really, the garlic and lemon are optional, so if you want to narrow down ingredients to make it a super simple roasted asparagus recipe, go right ahead. Stir together garlic and olive oil. 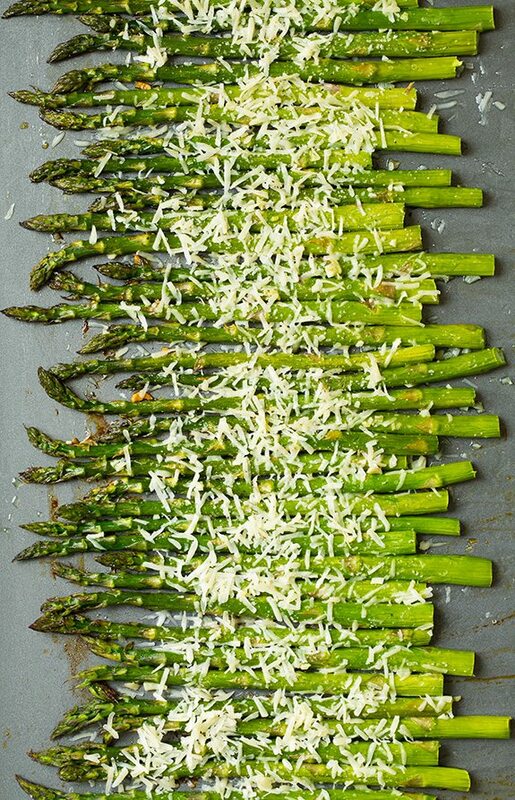 Place asparagus on baking sheet and drizzle with olive oil mixture. Toss to coat. Remove from oven and sprinkle with Parmesan, then place back in oven to melt the cheese slightly. Can I Use Another Type of Cheese in This Recipe? Yes, feel free to use any cheese you’d like. Firm, salty cheeses pair really well with roasted asparagus. You’re looking for the asparagus to be fork tender, but not mushy. You want there to still be a slight bite to it! 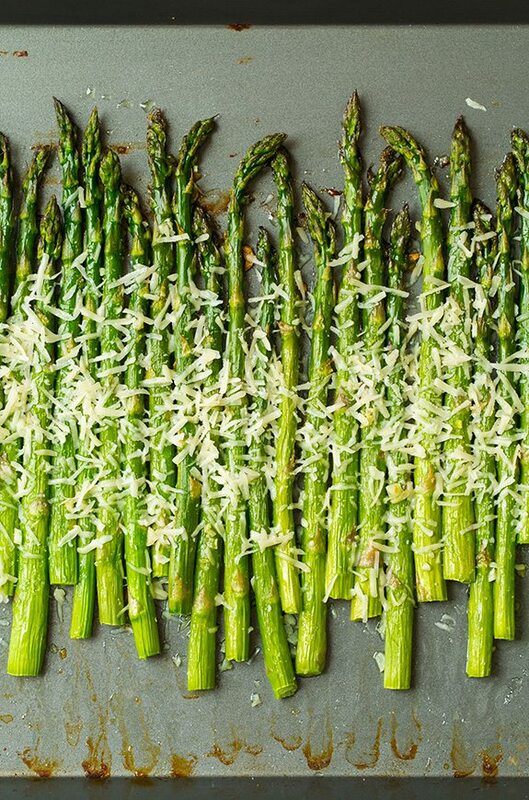 Buy thick asparagus and trim the ends before roasting. Roast asparagus in a single layer, otherwise it won’t cook properly. Roasted asparagus is best enjoyed right away, as it doesn’t reheat well. A super easy super delicious roasted asparagus recipe! Includes fresh garlic and shredded parmesan for great flavor. Perfect side to beef, chicken or fish. Preheat oven to 400 degrees F. In a small bowl, using a spoon stir together garlic and olive oil while pressing garlic against sides of bowl to extract some of the juices to infuse oil with flavor. 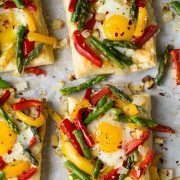 Place asparagus on a rimmed baking sheet in a mound then pour garlic mixture over top and toss and rub spears to evenly coat. 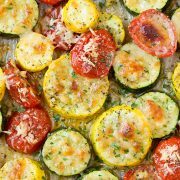 Spread into a single layer on baking sheet (place a row horizontally and couple rows vertically to fit them all if needed), sprinkle evenly with salt and pepper to taste. Roast in preheated oven until tender, about 15 minutes then remove from oven, sprinkle cheese evenly over top and return to oven and roast 1 minute longer, or until cheese has melted. Serve immediately with lemon wedges for spritzing. Roasted asparagus is best enjoyed right away, as it doesn't reheat well.